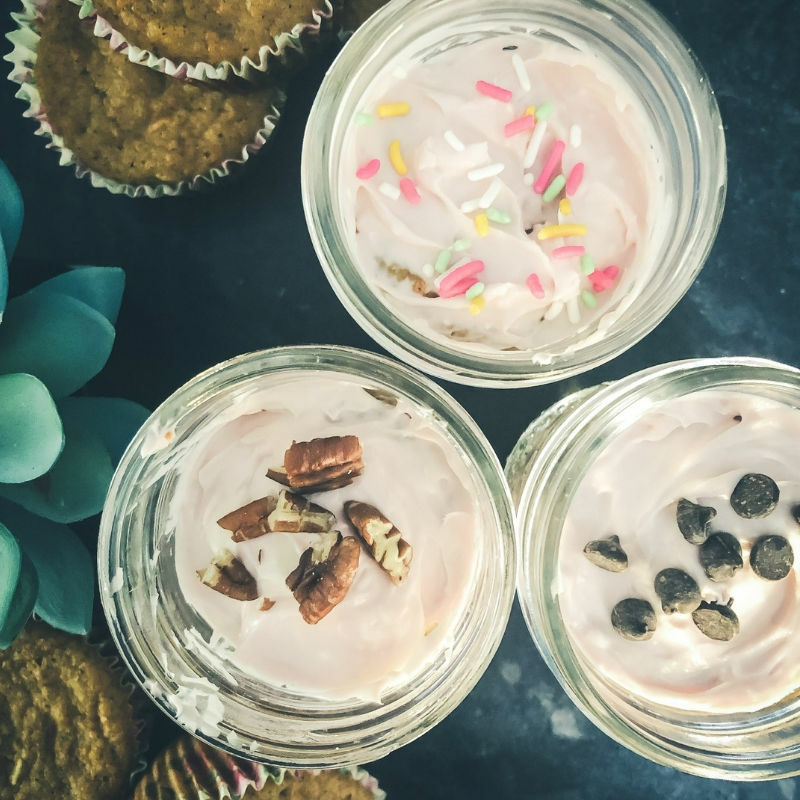 Have you ever eaten cupcakes in a jar? My Mom made like fifty of them for my baby shower a bazillion years ago and ever since I have been so incredibly in love with this dessert concept. Naturally, I had to figure out how to make them sugar-free and grain-free so we could still imbibe. If you’re following, you know I love to make muffins. 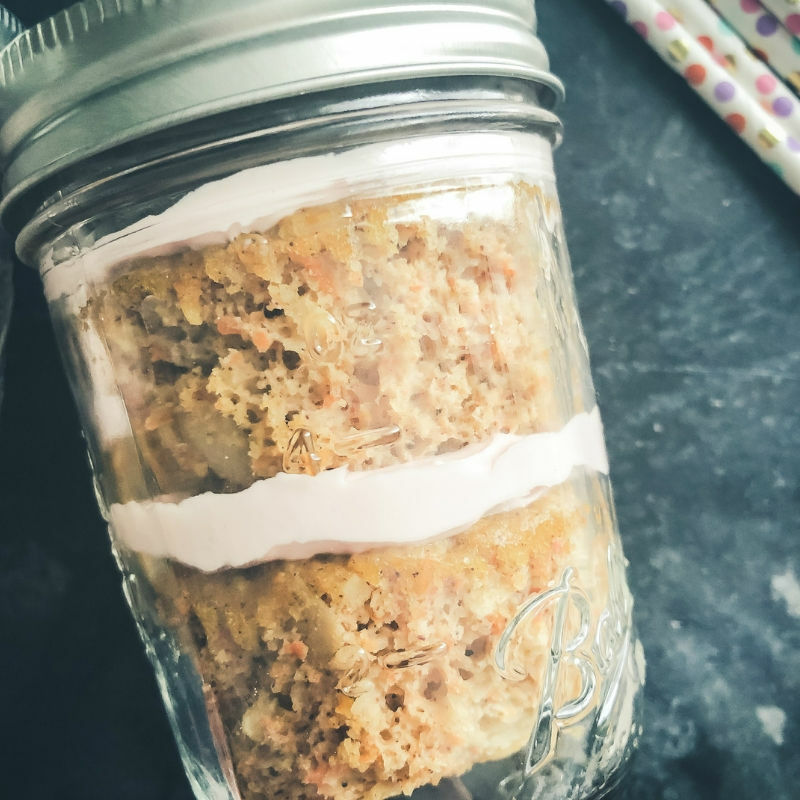 And, recently, I shared a super easy and delish carrot cake muffin recipe. 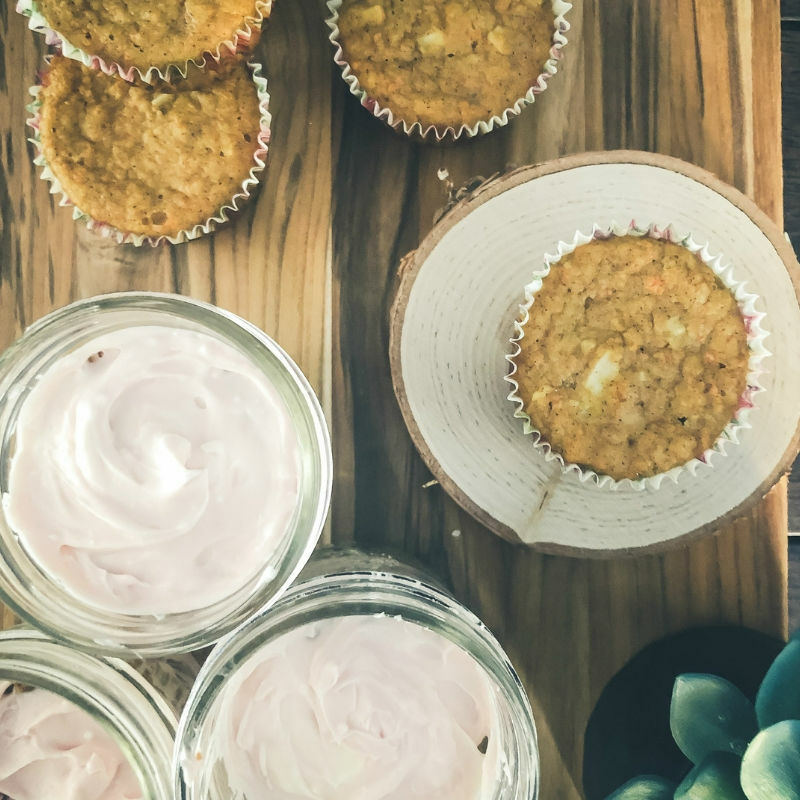 While my family loved these muffins without any frosting or extras (especially for breakfast! 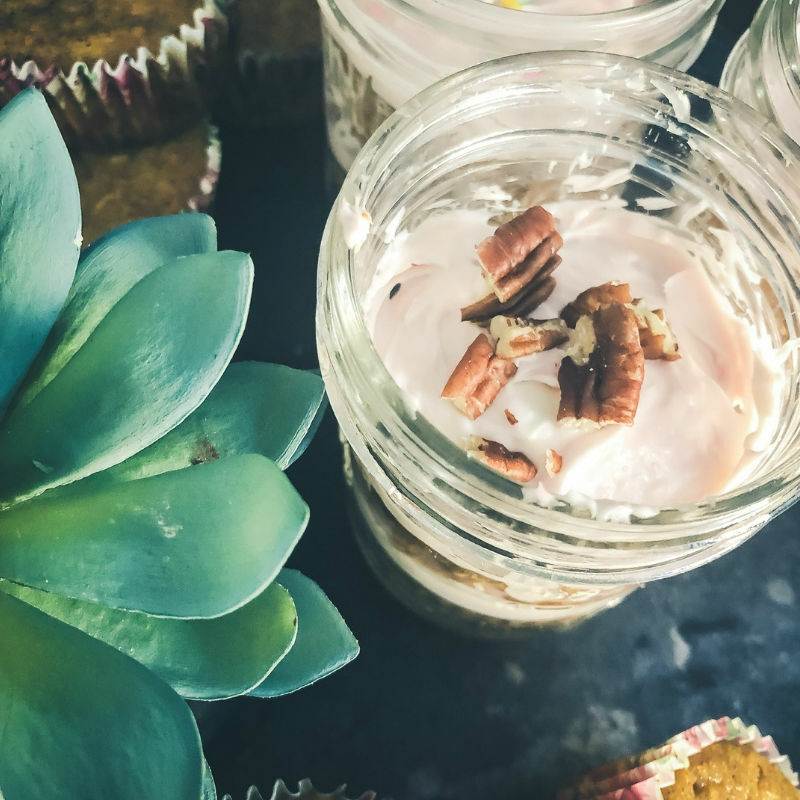 ), I was totally itching to take them to the next level and turn them into a super fun dessert – cupcakes in a jar for the win. 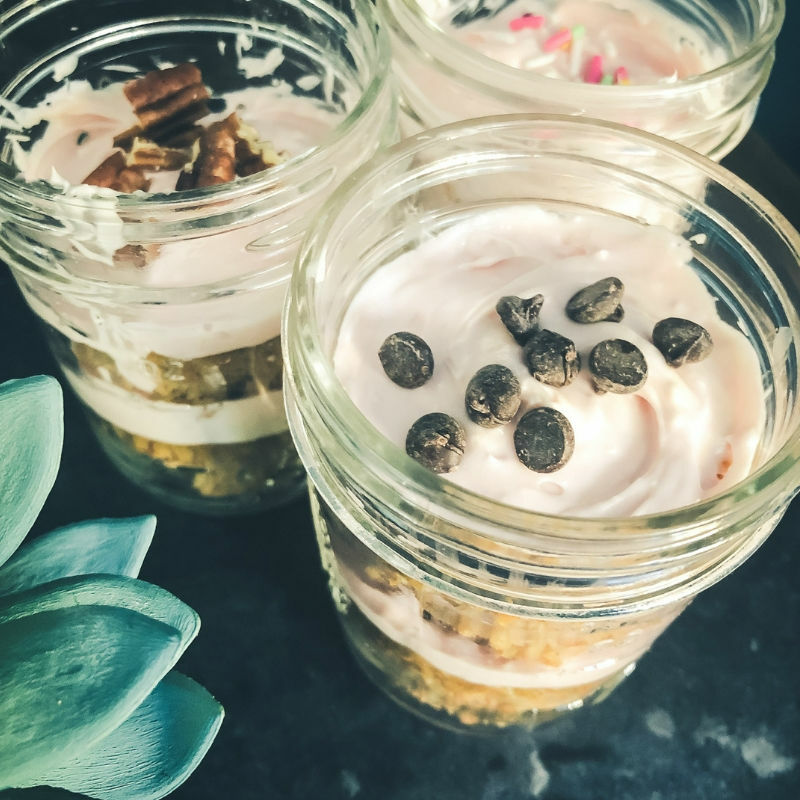 Since most cupcakes in a jar have 3 or more layers of frosting and, since we do watch our macros, I had to get a bit creative to both build a jar cupcake that felt like a jar cupcake, but also not create a dessert I wouldn’t feel comfortable including in my diet. 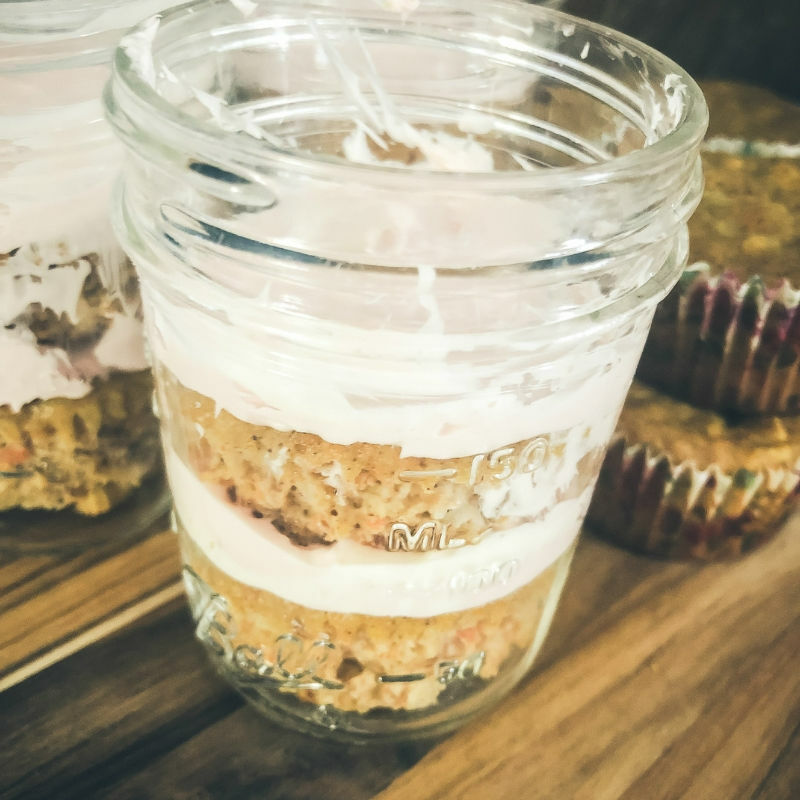 So, I picked up some half-pint mason jars and created 4 layers (2 muffin layers and 2 frosting layers). This combination worked perfectly size-wise within the jars (like, it filled them up without a ton of lingering space at the top) and kept the macros at a place I was cool with. I probably could have gotten away with a third layer (on the bottom of the jar which is often the BEST part), but I opted for more frosting on top. I’ll probably play around with it next time to add that extra layer. 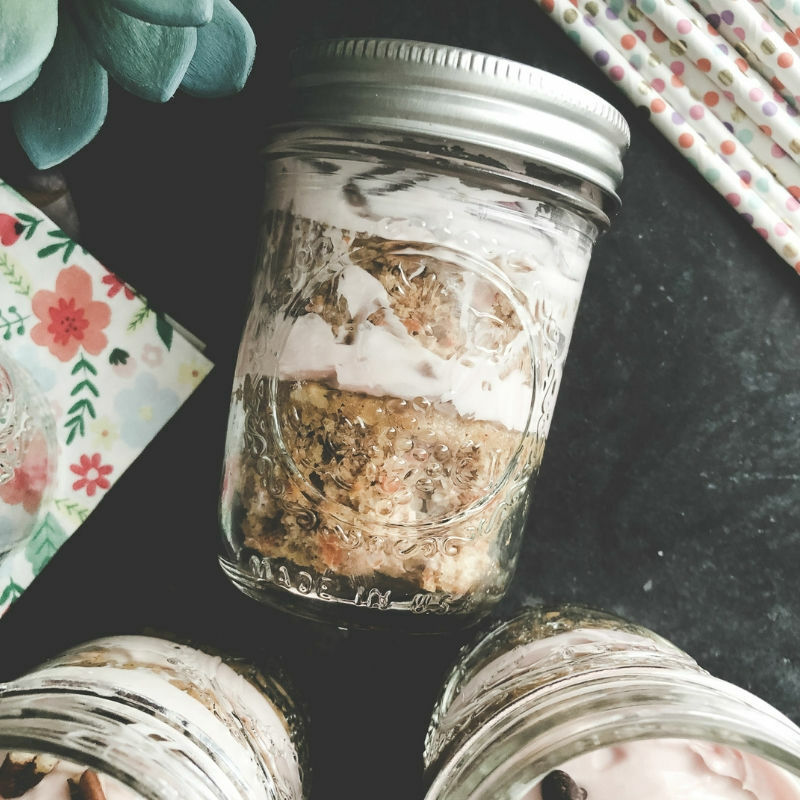 These cupcakes in a jar are great for anyone eating a LCHF or keto diet. They are also perfect for anyone who just doesn’t eat sugar or grains. Filled with healthy fats (hello coconut!) and a little beta carotene (healthy eyes are important guys! ), they make the perfect sweet treat without all the guilt. AND, my 5-year-old was OB-SESSED with them. 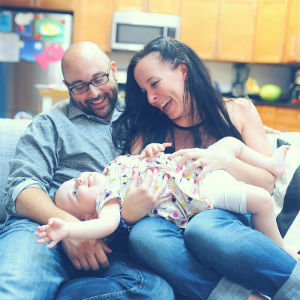 So, that’s less sugar and junk in her sweet little growing body. If you are counting carbs strictly (like 20 net grams or less for keto), these would fall on the higher side carb wise. They are only 12 net carbs per jar and can totally fit into your daily macros if you’re eating super low carb for the rest of your meals. But, just something to note for those of you eating super strict. GET CREATIVE WITH THE TOPPINGS! 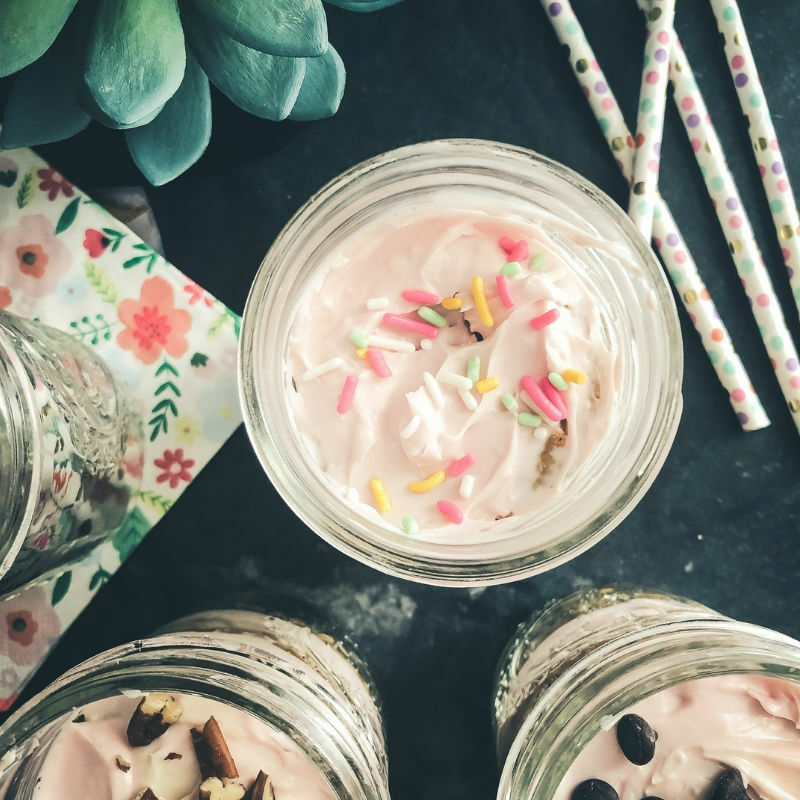 We got super creative with our toppings – since my daughter isn’t completely sugar-free, I did let her add a few regular ol’ sugar-based sprinkles for funzies. 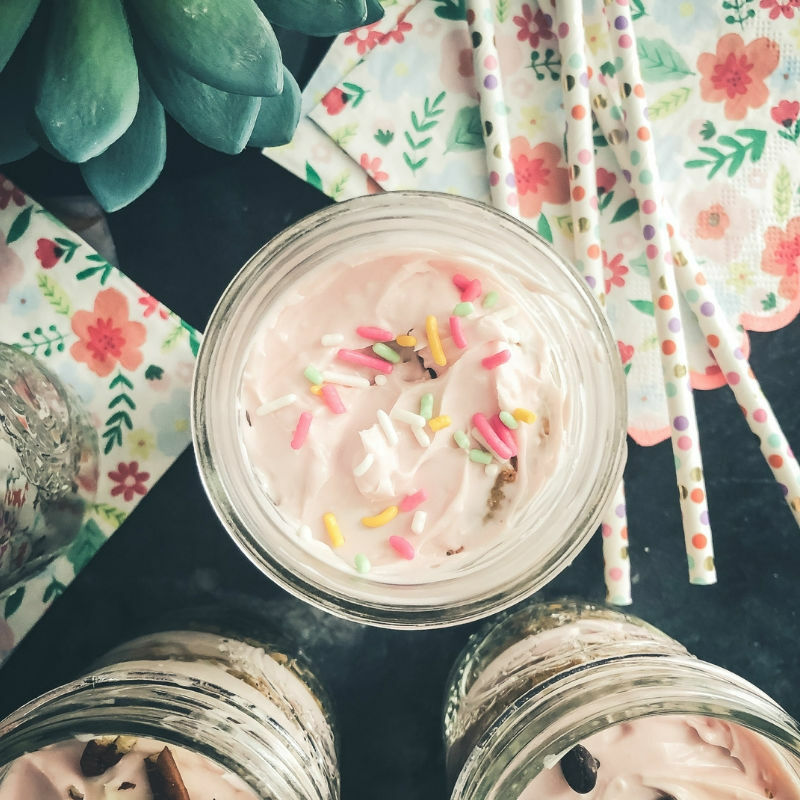 Although I haven’t tried it yet, there are tons of recipes out there for DIY sugar-free sprinkles that look pretty good if you want to add some color, but keep it totally sugar-free. We added some sugar-free chocolate chips (I like Lily’s best and get them at a great price at Thrive Market) and some pecans on top. You could crush up other nut varieties, unsweetened coconut flakes, fruit or whatever else you’d like to decorate. 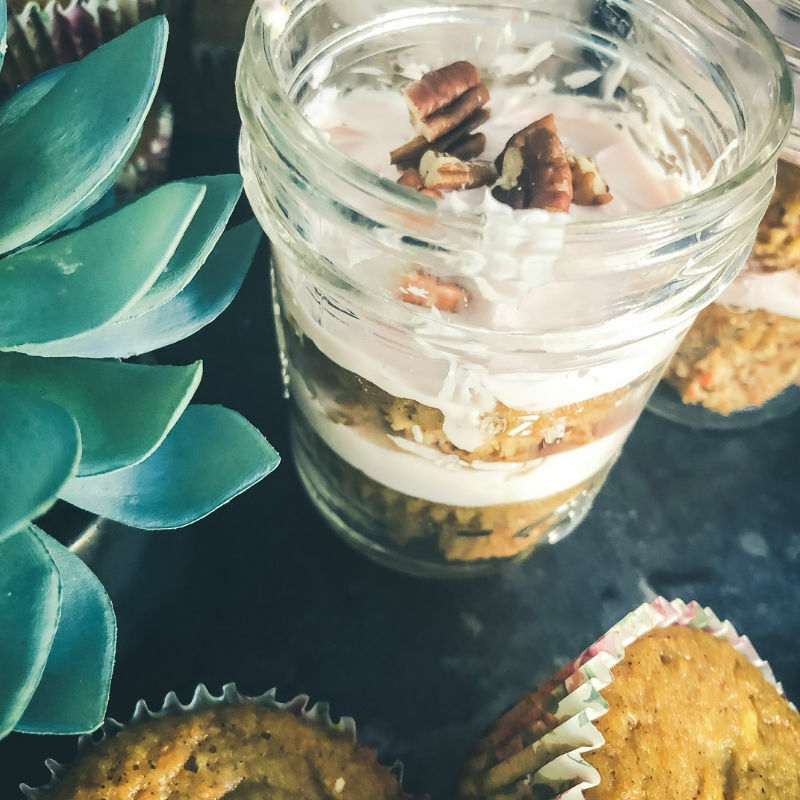 I liked the pecans best because they paired really well with the carrot cake muffins. The recipe is below! If you want to make the muffins without the jars and frost them like regular cupcakes, you could totally do that. It would change the macros slightly (for the better). Macros for the muffins without any frosting are right here (along with the non-frosting recipe). 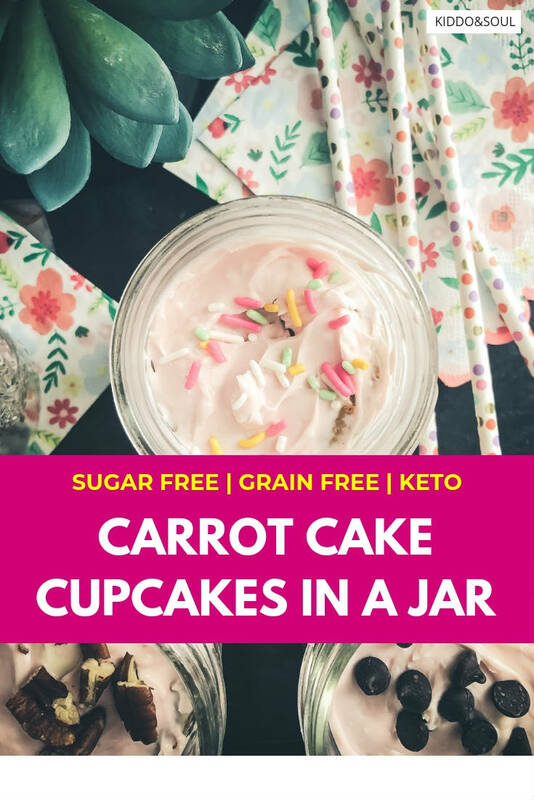 These carrot cake cupcakes in a jar are an amazing way to celebrate when you're eating a sugar-free or grain-free diet. They are perfect for birthdays, playdates or as a fun treat for the week. LCHF and keto friendly! 4 tbsp erythritol (or other sugar sub) I used 2 tbsp granular & 2 tbsp confectioner's style but I'm not sure it matters! Preheat the oven to 350 degrees and line muffin tin with parchment or cupcake liners. You can also spray the pan, but grain-free baked goods tend to stick more than others so spray well! NOTE: Batter will make approximately 15 muffins, but you will only need 12 of them to create the 6 jars. In a large bowl, mix all of the dry ingredients until combined. In a seperate medium bowl, add cream cheese and butter. Soften in the microwave for 15-30 seconds (enough so that you can easily blend the two together with a spoon (it's okay if the cream cheese has tiny lumps). Add the eggs to the cream cheese and butter, along with the apple cidar vinegar and vanilla. Lightly beat and pour into the dry ingredients. Mix until "loosely" combined and add shredded carrot and coconut. Mix well, until fully combined. Distribute batter evenly between the twelve muffin tins and bake for 15-20 minutes or until a toothpick comes out clean. Let cool and enjoy! NOTE: Baked goods using SWERVE always taste better the 2nd day (after the ingredients have had time to settle). They taste great on day 1 too - but will be even more magical the next day! 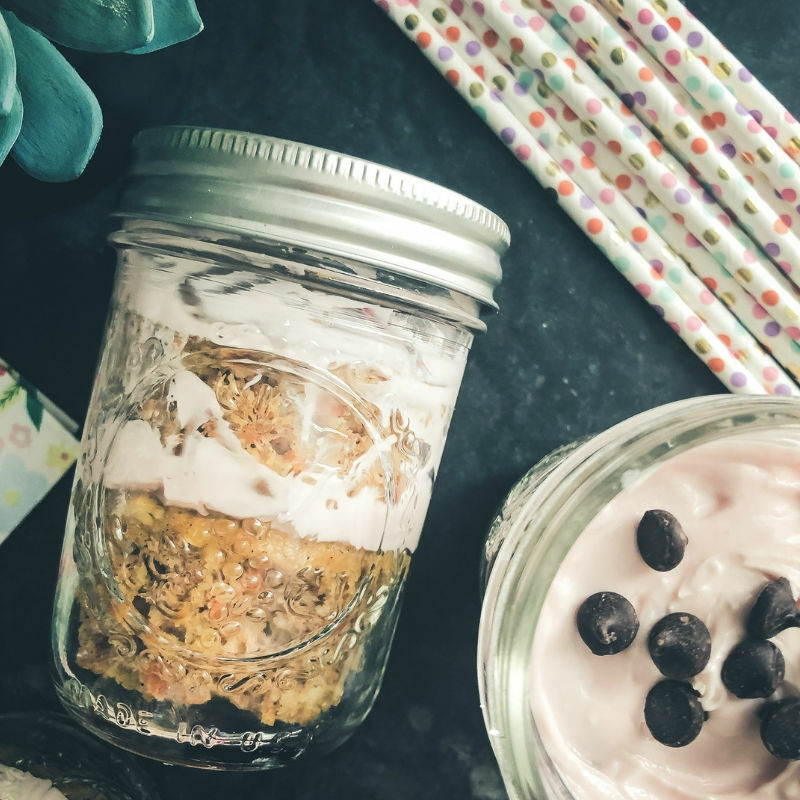 Soften the cream cheese (I do it in the microwave for 15 seconds) and combine with other filling ingredients (powdered erythritol, HWP and vinalla). Mix well until fully blended. Add food coloring if desired. 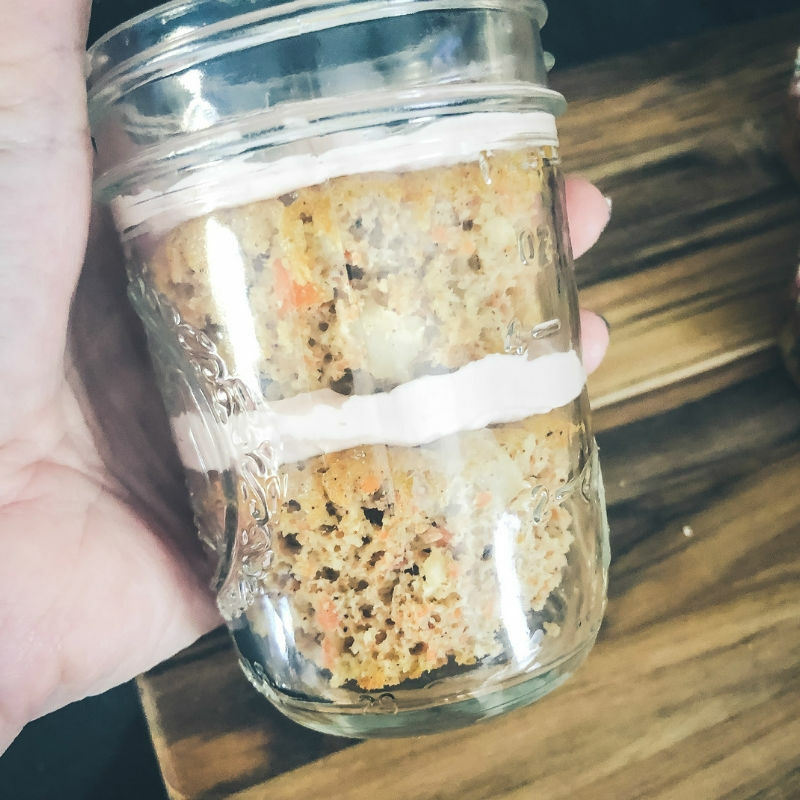 Drop 1 muffin into the botton of a clean, half-pint mason jar. Drop about 3/4 of a tsp of the filling on to the muffin and use spoon to evenly spread. Add second muffin and set aside. Follow above steps for remaining 5 jars until each jar has a bottom muffin, filling and top muffin. Then, evenly distribute the remaining filling on top of the muffins in the remaining jars. Top with sugar-free sprinkles, sugar-free chocolate chips, nuts, unsweetened coconut or other topping of your choice. Enjoy! MORE AMAZING SUGAR-FREE RECIPES HERE!